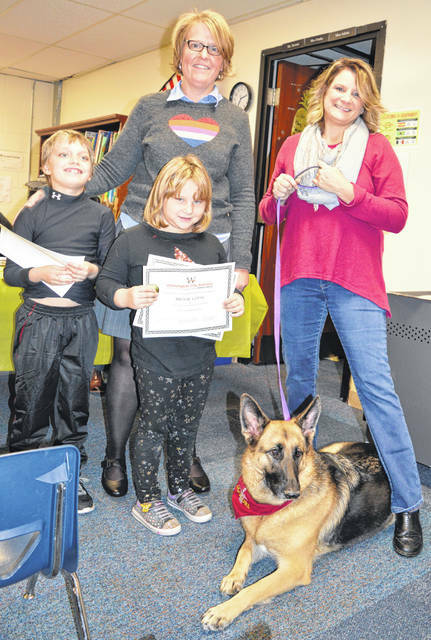 Kimi Hilderbrant, right, and her trained therapy dog Sydney, pictured, visit Holmes Elementary School in Wilmington about three times a week. They were recognized by Holmes Elementary Principal Karen Long, left. Young students who have helped Sydney and vice versa include, from left, Gavin Parley and Brook Copas. Sydney can help children open up and in other ways too, said Hilderbrant. Sydney can lift up her paw to signal bye-bye. Not present for the photo are Holmes Elementary students Elijha Faulkner, Bella Burwinkle, Camden McClanahan and Earl Faulkner.